Get to know The NIGHTHAWK! Note: Thanks to Wikipedia for the original draft of this article. 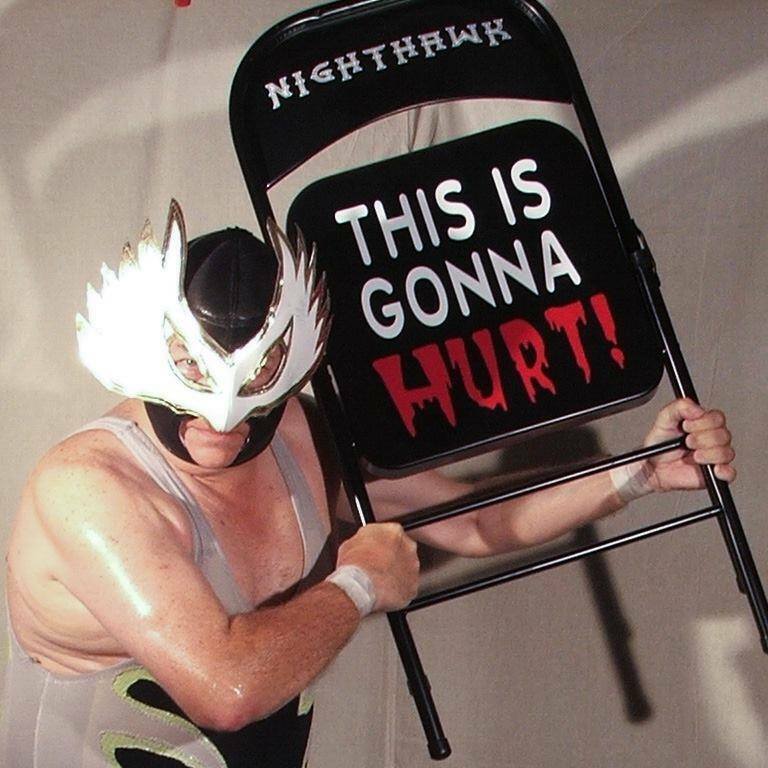 The Nighthawk is a popular masked wrestler in the Southern independents and won championships in several “outlaw” promotions during the early 1990s and sanctioned titles in the 2000s. In his career, The Nighthawk wrestled for various wrestling promotions: Continental Championship Wrestling, Jim Crockett Promotions, Professional Championship Wrestling, and the Universal Wrestling Association. He was one of many wrestlers whose career was affected by the collapse of the NWA territory system and spent several years in semi-retirement from wrestling, working in the fire service. The Nighthawk returned to wrestling in 2002 and made appearances for AWA Superstars and the National Wrestling Alliance, in addition to a considerable number of independent wrestling promotions in Florida and Georgia. He continues to tour up and down Florida and Georgia. Early life: He grew up in Texas and became a fan of pro wrestling primarily through his father and grandfather who exposed him to their favorites such as Lou Thesz, Chief Don Eagle, Jose Lothario, and Fritz Von Erich. After learning freestyle wrestling and gymnastics in prep school, he went on to play other sports (two years of tennis at Gulf Coast State College, a season of semi-pro baseball in Florida with the Panama City Flames, a season of semi-pro football with the Ocala Outlaws) including tennis, golf, and kickboxing at a competitive level, earning honors in each. The late Gordon Solie, WWE Hall of Fame broadcaster, introduced the future Nighthawk to the backstage world of pro wrestling and was his point of contact for World Championship Wrestling (WCW), Championship Wrestling from Florida (CWF), and Continental Championship Wrestling (CCW). Prior to entering pro wrestling as a competitor, he was a sports writer and photographer for several professional wrestling magazines in the US and United Kingdom, most notably, as a contributing editor for Wrestling Eye and Wrestling Fury. It was while covering the sport that Steve Keirn, then of The Fabulous Ones tag team and later head of WWE’s developmental territory Florida Championship Wrestling, suggested that he should begin training as a wrestler himself. Keirn felt that, at 6’3″ and 235 pounds, the future Nighthawk was wasting his size behind a camera. In 1988, he sought out training from Dean Malenko, The Man of 1,000 Holds and Pro Wrestling Illustrated’s top-ranked wrestler for 1997. Early career: From there, he moved to Panama City, Florida, and made his debut with Universal Wrestling Association as The Nighthawk. He lost his debut match on March 15, 1990, to The Spade, but spent the next year in UWA’s training camp and appeared with WWE Hall of Famer Bullet Bob Armstrong, the “Exotic” Adrian Street and many others in the former Continental Championship Wrestling area of north Florida and south Alabama. The Nighthawk went on to great success as a rookie in the UWA, winning both the Junior Heavyweight Championship on August 2, 1990, and the UWA Tag Team titles on July 26, 1990, with The Eliminator. In late 1992, he worked in the Professional Championship Wrestling (PCW) promotion, run by the late WWE Hall of Famer Big John Studd, and was the PCW Cruiserweight Champion. The Nighthawk Returns: After spending several years in the fire service, The Nighthawk returned to pro wrestling with various promotions across the South, first in north Florida’s World Independent Wrestling where he was half of the tag team champions, losing the belts to old rivals The SWAT Team (The Trooper and The Cobra) whom he had battled in the UWA. It was The Cobra that The Nighthawk defeated for the UWA Junior Heavyweight championship. The Nighthawk also lost a WIW Light-Heavyweight title bout to Johnny All-Star after their tag team dissolved. IWA Worldwide and SCW Texas Champ: From WIW, he was tapped by the IWA Worldwide to be its first Heavyweight Champion and to defend that title anywhere in the US. As a traveling champion, this led to matches against the likes of Rebel Rob Lee, a graduate of Larry Sharpe’s Monster Factory, in the Georgia Wrestling Alliance (GWA) and Awesome Pro Wrestling (APW). He also defended the IWA title against Drew “Blood” Bannen, a graduate of Exotic Adrian Street’s wrestling school, in Universal Classic Championship Wrestling (UCCW). The Nighthawk also appeared in Southern Championship Wrestling (SCW) as its Texas Heavyweight Champion and made a notable defense against The Saint, a graduate of the legendary Hart Family “Dungeon” in Calgary. The Nighthawk in the NWA: A longtime goal for The Nighthawk was to appear in the National Wrestling Alliance where his heroes Jack Brisco and Dory Funk, Jr., had their legendary battles for the NWA World championship. Based on the record he had built in the tri-states (Alabama-Florida-Georgia) area, The Nighthawk was invited to wrestle for NWA Championship Wrestling from Florida (NWA-CWFL), managed by Vanessa Harding, a long-time friend who had also managed him in SCW. While unsuccessful in his efforts to wrest the NWA South Atlantic title from champion Redd Alert, The Nighthawk became a popular star in the Orlando area and eventually defeated Bryan Fury to win the NWA Gulf Coast Heavyweight Championship. A previous version of this title had been held by the very same Jose Lothario, Cowboy Bob Kelly, Ken Lucas, and many other stars of the region in the 1970s. Nighthawk in the AWA: In 2005, The Nighthawk was recruited by the Great American Wrestling Federation (GAWF) to make some NWA Gulf Coast title defenses. When GAWF joined the American Wrestling Association (AWA), this created an opportunity to chase another championship under another major sanctioning body. After a year in the territory chasing champions such as “Mr. Education” Bobby Sanford (a Marty Janetty trainee), The Nighthawk eventually caught a title shot against Steve Dalton and won the AWA Coastal Heavyweight championship. He defended that belt in a series of matches against contenders such as Alucard and Mr. Fantasy until leaving from the promotion and vacating the championship in 2006. The Nighthawk continues to tour as a guest star across the Southeast for a variety of promotions and represents the Insane Wrestling Alliance as its Florida Heavyweight Champion. 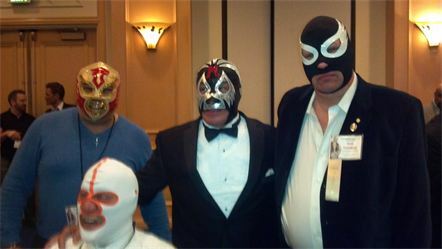 The Nighthawk is also a Life Member of the Cauliflower Alley Club and a state-licensed mixed martial arts trainer.